A new UV LED system of Heraeus’ NobleCure® series for special pinning applications to optimize your curing processes. Heraeus Noblelight presents a new efficient UV-LED solution for effective pinning applications at LabelExpo Americas 2012. Learn how to optimize your curing process and save energy at the same time – discuss your application with our UV-LED experts at the Heraeus booth at LabelExpo Americas, September 11-13, 2012 in Chicago, booth no. 5218. Time for drying and curing inks is very limited in an integrated manufacturing process especially when the market requires increased printing speed. In a multicolor printing process it is important that each color is perfectly cured or, depending on the process pre-cured or “pinned” to avoid that the colors bleed into each other. Heraeus Noblelight has developed a flexible and modular UV-LED system for these special pinning applications. The new system belongs to the well-established NobleCure® series and offers the same significant advantages such as low power consumption, low heating of sensitive materials, long lifetime and low weight to name the most important. The new air-cooled UV-LED module is very light, small and extremely silent. It can be adapted to almost every of inkjet head established in the market. Because of its plug & play characteristics the installation is simple, no separate cooling units nor custom specific power supplies are required. Total optical output irradiance, UV dose, working distance and peak wavelength - all play an important role on the printing quality and manufacturing efficiency. 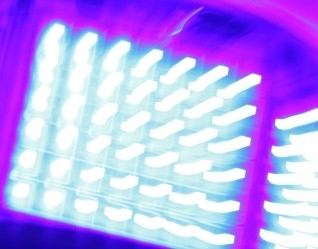 These parameters had been optimized in the new UV-LED system to reach the best curing results. Efficient optical and thermal design of the Heraeus NobleCure® series ensures low energy consumption. All Heraeus NobleCure® are instantly switchable and dimmable for a large range of applications and curing conditions in the printing process.